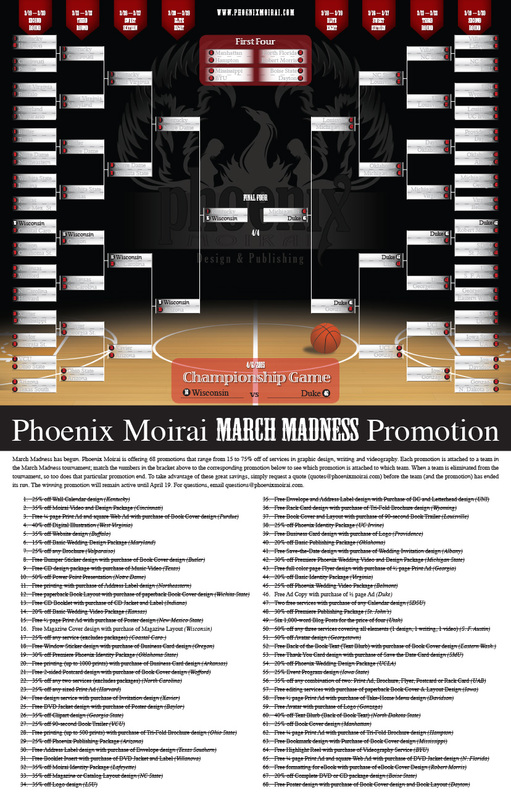 Along with the NCAA basketball tournament, the Phoenix Moirai March Madness Promotion is down to the final two champions, which will duke it out tonight for extreme supremacy. It has been a long hard fight that included a few major upsets (I think Kentucky may still be burning — I didn’t know calendars were that popular anymore!) to reach this point, but none of that matters anymore. All that matters now is which deal will take the ultimate trophy. So what deals are competing for the March Madness Promotion championship? Don’t forget: the winning deal will remain active for the next 14 days, which means you will have until April 19 to take advantage of the great savings offered by the champion. But anything can happen today, so don’t wait to request a quote, because you never know which team will take home the ultimate prize. This entry was posted on April 6, 2015, 8:23 am and is filed under Miscellaneous Stuff, Promotions, Sports. You can follow any responses to this entry through RSS 2.0. You can leave a response, or trackback from your own site.